Multiple removal potential off a Link Summon, providing monsters are not linked. In case anyone isn’t up to par with the lingo, linked is if the arrow on a Link Monster points to another monster. 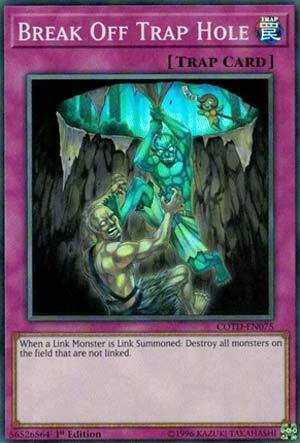 If a monster isn’t linked to a Link Monster when the Link Monster is summoned, several monsters may be saying “bye-bye” upon Break Off Trap Hole’s activation. The one downside is that it states “all monsters on the field”, that includes yours. While this won’t be a problem if you have a clear field or are linked up, it can hint at what you may be sitting on if you make certain your monsters are linked. If your opponent uses all their monsters for the Link Summon they will only lose the Link Monster, so it will be like a regular trap hole. If you can avoid the backlash this card can offer, it may be a card to think about in the Side Deck. Crunch$G In the set Link Monsters make their debut, we already get an anti-Link card in Break Off Trap Hole. Not only is it anti-Link, but it is a Trap Hole, so it has synergy with the Traptrix cards. Break Off Trap Hole is a card that can be activated when a Link Monster is Link Summoned, and it destroys all monsters that are not linked on the field. Sounds great in theory, but it also affects your cards as well. If you control no monsters, then this is neat to stop that first Link Summon and slow your opponent down and you are also safe if your monsters are Linked, however if you have monsters, you have to consider if your board is worth getting rid of your opponents Link Monster or stopping them right in their tracks with whatever play they might of been going for. The card is decent, but not really handy right now, as Links haven’t really taken off that much yet. It has potential in the future, though. Alex Searcy Break Off Trap Hole, appropriately named, joins the ever growing family of Trap Hole cards. This card specifically is anti-Link. When a Link Monster is Link Summoned, you can destroy ALL Monsters on the Field that aren’t linked. This could be quite devastating. Honestly, it should only grow to be more powerful too. As long as you even destroy just one Monster, you come out even, and it wouldn’t be very hard to plus off this card at all. But the problem I imagine being with this card is, it doesn’t destroy the Link Monster itself. That’s kind of a downer but I still think this card could be some solid Tech.